Get Djinn Tamer: Rivals here! As a new season of the Djinn Battle League fast approaches, Jackson prepares to enter training camp — a grueling series of tests to discover talented new tamers. The rules are simple: if you’re not the best, you go home. For a young man who lives to battle, going home isn’t an option. There’s only one problem — Jackson isn’t so sure he deserves to be there in the first place. With competition heating up, Jackson’s bond with his Djinn will be tested to their limits. But no matter how much he trains, if his new monsters won’t work together, he won’t stand a chance. The fighting will be intense. The rivalries, fierce. At the end of the road, the chance of a lifetime awaits. Against friends and foes both old and new, can Jackson prove he’s worthy of a shot at the big leagues? 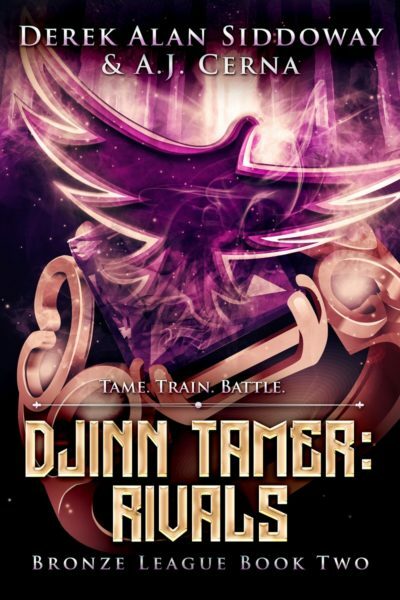 Djinn Tamer: Rivals is the second book in the Djinn Tamer series, a monster-battling GameLit adventure for fans of Pokemon, Digimon and Monster Rancher.